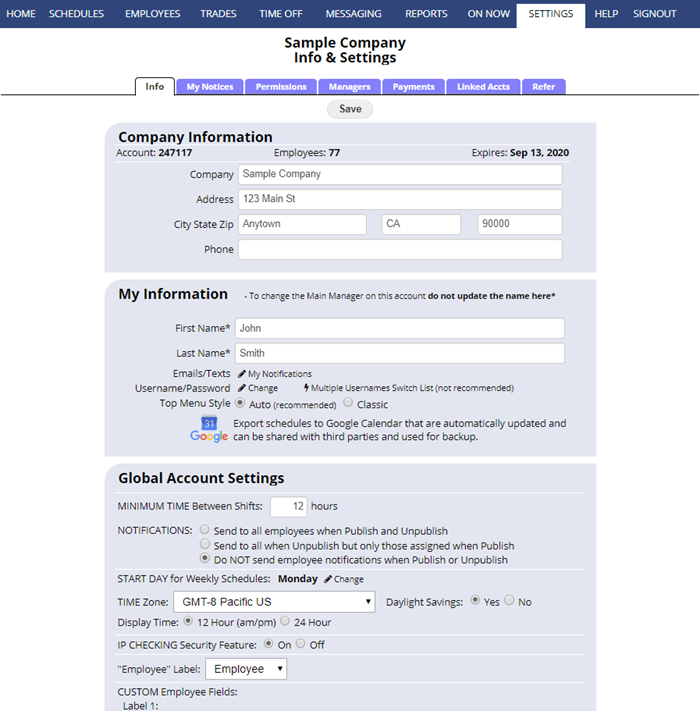 All of the company-wide settings are found on the SETTINGS>Info & Settings page which can be accessed by the Main Manager and managers with permission to edit company settings from any page using the top menu. All Managers can view the “My Information Section” on this page. Your company information – address, etc. Your Schedule START DAY: During your free thirty day trial, the Main Manager will see a link to change the weekly schedule start day immediately. On paid accounts, the Main Manager can request the start day change and it will be accomplished in that night’s update. SEND NOTIFICATIONS when schedules are published or unpublished: Setting to “Yes” means that employees who have chosen that Notification option are automatically emailed their schedules when a schedule is published and will receive a “schedule retraction” email if a week is UNpublished. This setting takes effect immediately. For example: you can click to SETTINGS page, change this option to not send notifications, and click the Save button and then unpublish and no notices will go out. Then go back to the SETTINGS page and change the option back to Yes and click Save again to immediately reinstate notifications so they will go out the next time you Publish or Unpublish. You can upload your company logo and it will be displayed on the manager home page, all printouts and reports, and all employee pages and printouts. Note: Our system displays your logo graphic at 150 pixels wide so for the sharpest results, please resize your graphic to 150 pixels wide before uploading. If you want to change the logo, you can upload a new graphic, or to remove your company logo, contact When to Work Support using the link at the bottom of any of your account pages and we can remove it for you.